NSREscapeGames Halloween Escape 2018 Chapter 7 info about the game-Games2Rule. Samir will be saved soon! there are 3 more diamonds to collect! Soon Mia would get relieved of the tasks given by the witch. 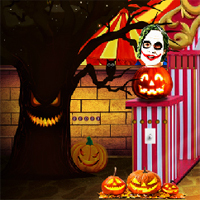 Solve the exciting puzzles and enjoy the halloween experience! Solve amazing puzzles as the witch tells and enjoy the halloween moments in the game.once you compelete this chapter you got one diamond .Have a fun!